. . James Maxwell takes you through a collection of his recipes using cement, aggregates, and bonding agents in a how-to-book using cement/concrete as a fine art media. The "Cookbook" introduces creating art using specific mixtures in projects ranging from ancient-looking garden planters, faux stone paths, and sculpture mixes using armatures, to stylish containers and innovative food-safe dinnerware. Photo-illustrated, the procedures are shown in progress and shows the completed art pieces in use indoors, in the garden, or the art gallery.
. ..Short stories about traveling, from the point of view of an artist, a poet, and a geologist. 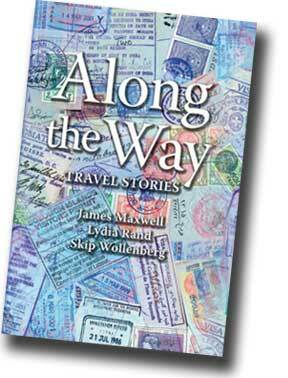 Meet James Maxwell, Lydia Rand, and Skip Wollenberg on the road. See more illustrations by James Maxwell. Names and words associated with James Maxwell are: artist James Maxwell, author James Maxwell, illustrator, Graphic designer, painter, watercolorist, sculptor, multimedia artist, writer, The Concrete Gourmet's Cookbook, cement recipes, concrete recipes, how-to mix concrete, concrete art projects, Along the Way - Travel Stories, he is co partnered with Mendocino Stories an online community of artists, writers, and musical artists, http://www.mendocinostories.com, he is one of three coauthor, and the graphic designer, of Along the Way Travel Stories.